Thanks to my friend, Charles Fischer, I have had the great opportunity to write about many of my favorite offensive schemes here on FishDuck.com. From the Zone Read Bubble to One Back Play Action to Packaged Tempo Plays, these analyses have been about concepts that are the heart of my own personal offensive philosophy. 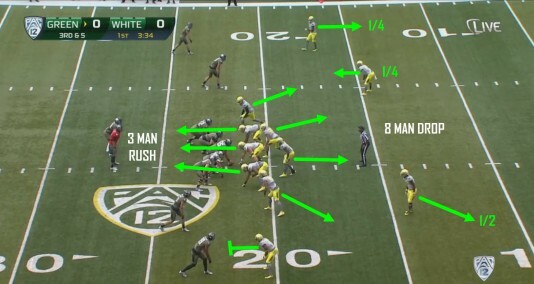 One of the few core spread offense concepts I had not broken down was the No-Back/“Empty” formation and near the end of the first quarter of this year’s Oregon Spring Game, I finally saw my chance. 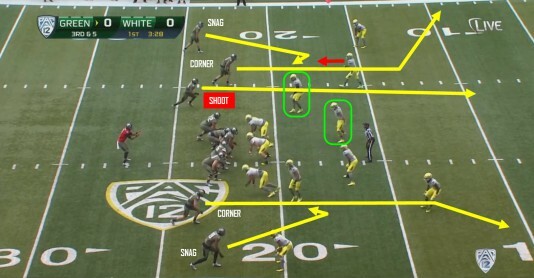 The Ducks opening touchdown of 2014 came out of a well designed Empty Backfield passing play, and I knew it was time that this particular formation had a FishDuck analysis. We have been running the Empty Backfield (Empty) here at Villanova for more than a decade as this formation is a great way to spread the defense and create match-ups in the passing game. By emptying the backfield, offenses often times can lock a defense into a coverage look — giving the quarterback a clear picture of what he’s up against. Defenses usually enter games with a clearly defined philosophy for defending Empty. These calls/checks are often schizophrenic in nature — they will do an aggressive pressure defense designed to hit the quarterback or present a prevent look with 8 defenders in coverage built to stop the big play. Empty also gives offenses the freedom to move receivers and backs to different spots on the field. A well-constructed Empty package will match up an offense’s most explosive players with a defense’s worst pass defenders. When there are no backs in the backfield, there is also nowhere to hide for defenders who can’t cover. 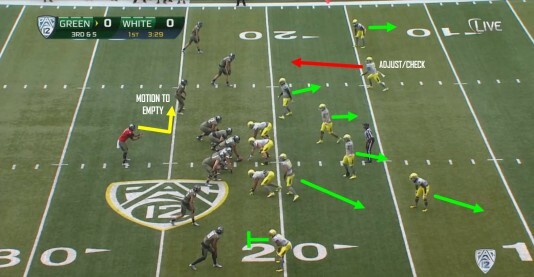 This article will show how the Ducks used motion to Empty, combined with a passing concept designed to create a mismatch, to create yet another explosive play. Does Mariota have a blitz coming? Late in the first quarter, the squad led by Marcus Mariota was faced with a 3rd & 5. The defense took a split personality approach to this situation — first showing a 3-down lineman look with 7 potential rushers tight to the box. The secondary also shows a blitz look early — with all 4 defensive backs appearing to be in man coverage. When Mariota claps his hands (usually an indication he is ready for the snap — ( however not in this case) the defense switches from attacking to backing out. The safeties bail to a 2-deep look — showing Cover 4 (“Quarters”) to the field and Cover 2 (“Halves”) to the boundary. The field-side safety calls a new coverage? After the defense backs out, it’s Mariota’s move. His hand clap made the defensive tip it’s hand thinking the ball would be snapped soon after. 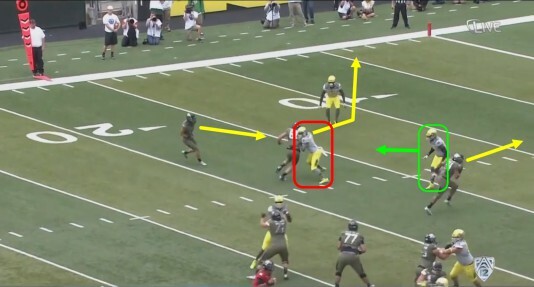 Rather than snap the ball, the Ducks change their formation sending tailback Thomas Tyner in motion (yellow arrow). Tyner moves from offset back to the left of the quarterback, to the third-option receiver to the field. The Ducks are now in an Empty formation initiating a cover adjustment/check from the field safety (red arrow) that none of his fellow defenders comply with. Trying to get a matchup with Tyner. The pass called is a mirrored Snag concept designed to get Tyner single covered in the middle of the field. Both slot receivers (to the field and boundary) run corner routes. These routes will remove the safeties from the hashes vs zone coverage. 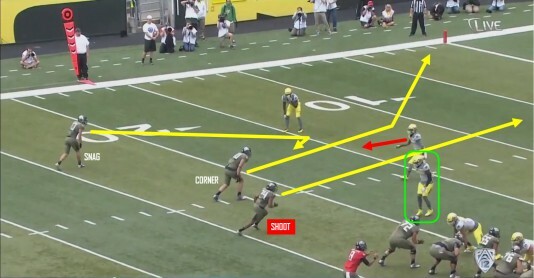 Both outside wide receivers will run snag routes — angling in to the stem (path) of the corner route. The snag routes will sit in the open area of the zone – holding down the underneath defenders. 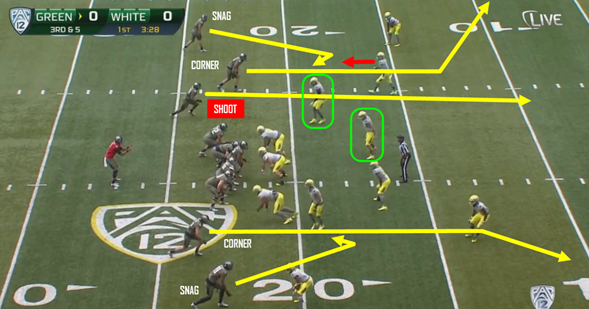 This allows Tyner’s “shoot” route to work the middle of the field against either an alley player or linebacker (green boxes). This play is also helped by the field safety dropping down to play Cover 3 (red arrow) when all the other defenders to his side are playing quarters. The field safety is playing a coverage no one else in the secondary is playing — resulting in a huge open area in what should have been a 2-deep look. A closer look at the Snag-Corner combination shows how these routes occupy the field safety and corner. 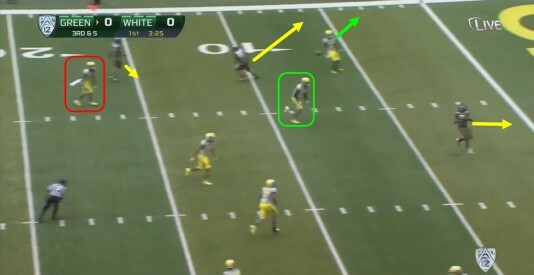 With the Snag-Corner combo on the other side of the field doing the same thing to the boundary safety and corner, the only person left to cover Tyner on his way to centerfield is the alley player (green box). This is exactly the match-up the play was designed to create and exploit. Two defenders take the underneath zone. Once the ball is snapped, the field safety (red box) collisions the corner and the alley player turns to cover the snag. There are now two defenders in the same underneath zone (red & green boxes) and no one even trying to slow down Tyner as he runs down the middle of the field. Eight defenders in coverage and he still gets open? 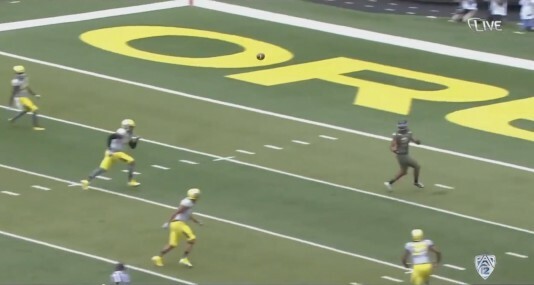 The wide angle shows no deep defenders left to cover the shoot route by Thomas Tyner. The boundary safety (playing Cover 2) has been removed by the corner route while the field safety (red box) is completely out of position due to a mental error. 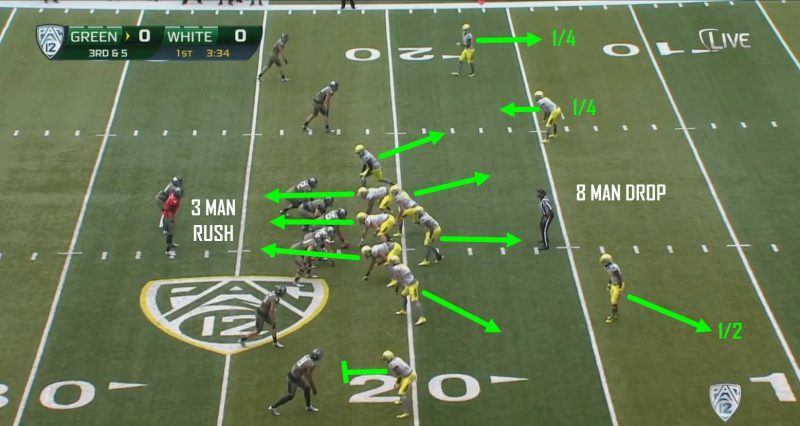 Even with 8 men in coverage, the Ducks have utilized motion, formation and scheme to get a receiver wide open! An Empty backfield brings a Full six points. Much like Drew Brees and Tom Brady who have shredded the NFL with the Empty passing game, Marcus Mariota has the vision, accuracy and football IQ to make this package a special one for Oregon. A shortage of experienced WRs? No problem.